Diddy talks trash, it's what he does best but when he called his vodka competitors product "urine," Georgi Vodka owner Martin Silver didn't take kindly to that. 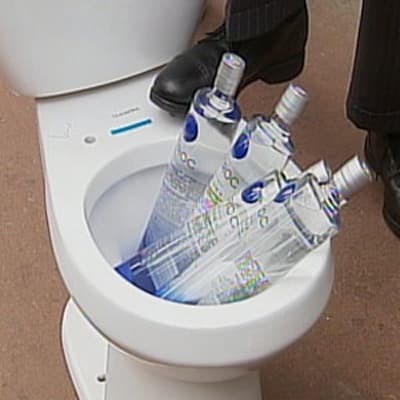 Before holding a press conference, Martin had a toilet filled with Ciroc sent to the Bad Boy office. Granted it didn't get past the front door, but the message was sent. We are sure Diddy fired a few people for not coming up with the idea first. Or at least got them to ding-dong-ditch a flaming bag of deuce at Georgie HQ.